I am testing recipes for a cooking class I am teaching next week. Though I assume there will be ladies of all different skill levels, I feel it is a unanimous preference to have a simple dessert recipe under your belt. We will make a naturally sweetened cake too, for those that like to spend more time on their treats. However this recipe requires one mixing bowl, and everything else goes straight into the pan. Since I will be acting as both teacher and dishwasher, I strongly approve of the limited mess involved here. I think this general idea inspires so many other combinations as the seasons change. In the summer you could substitute peaches, and use vanilla bean instead of cinnamon in the yogurt cream. Or I imagine in the fall, you could give the pan a bit of extra time in the oven and use apples instead... then sprinkle some granola and nuts on the top. It's dessert, but I mean, if there is granola involved, you can call it breakfast. That's what I tell myself when I get into the oatmeal cookies first thing in the morning. Don't judge me. I used three pears, because that is what fit perfectly into my cast iron skillet. You could probably adjust more or less depending on what type of pan you use, just be certain it is heavy bottomed and oven proof. I don't often push an organic agenda, but since this is a short list of ingredients, I'd suggest using organic dairy products for best flavor results. 1. Cut the pears in half length wise, use a small spoon or melon baller to remove the tough seeded center. 2. 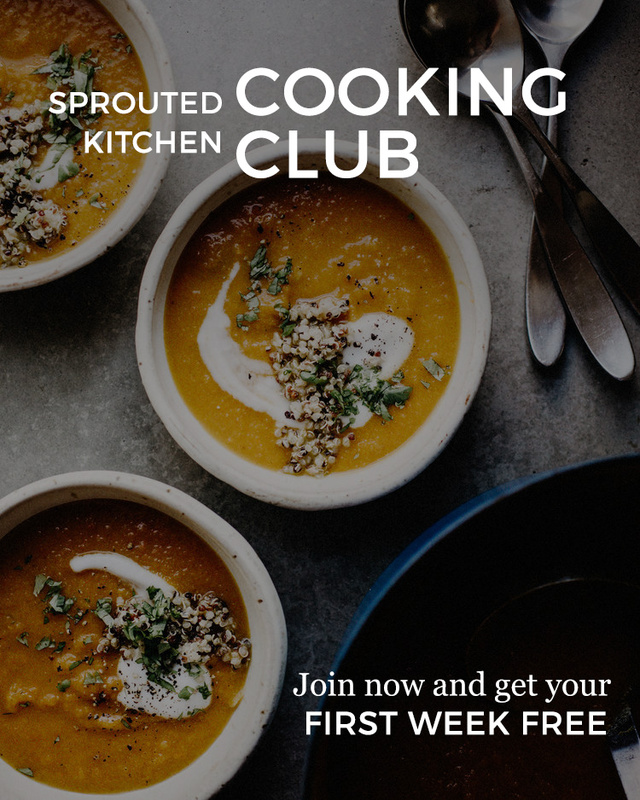 In a cast iron or heavy bottomed skillet, add the butter, honey, vanilla, muscavado or brown sugar, thyme sprigs and a generous sprinkle of salt. Let everything come to a gentle boil and stir continuously, about 2 minutes. 3. 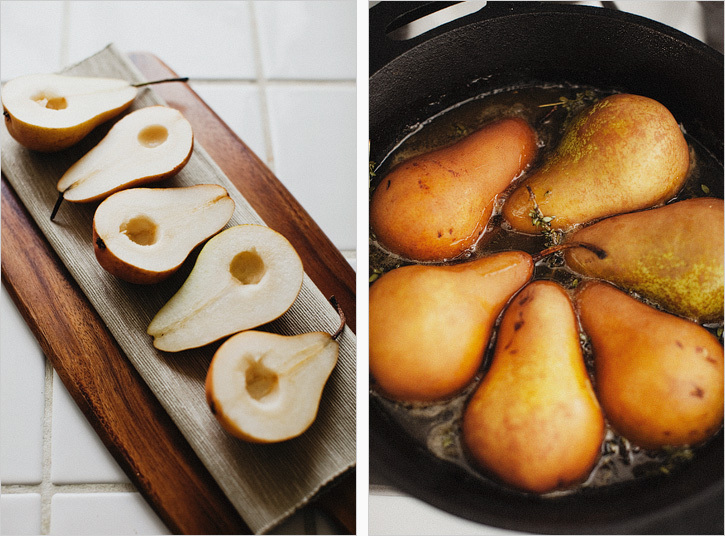 Add the halved pears to the pan, cut side down. Give it a shake and let them simmer on the stove about 2 minutes. Turn the pears over so they are now cut side up and transfer the pan to the oven, middle rack. 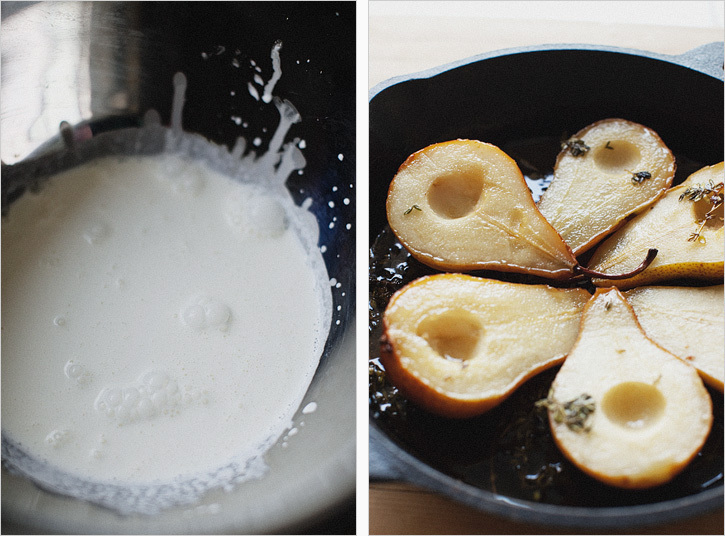 Bake for 12 minutes until the pears are soft and the sauce has caramelized. 4. 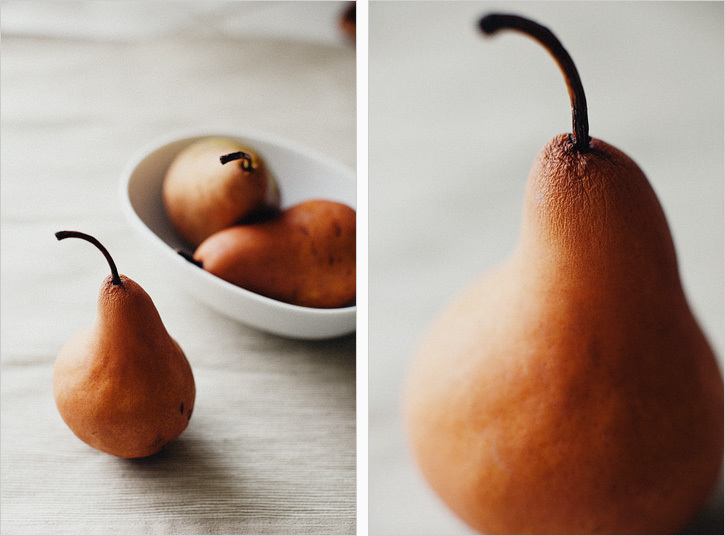 While the pears are baking, beat the cold whipping cream with an electric mixer until stiff. Add the honey, pinch of salt, cinnamon and beat another minute to combine. Gently fold in the greek yogurt, this will make it a bit thinner, but that's ok, it still tastes lovely, I promise. 5. 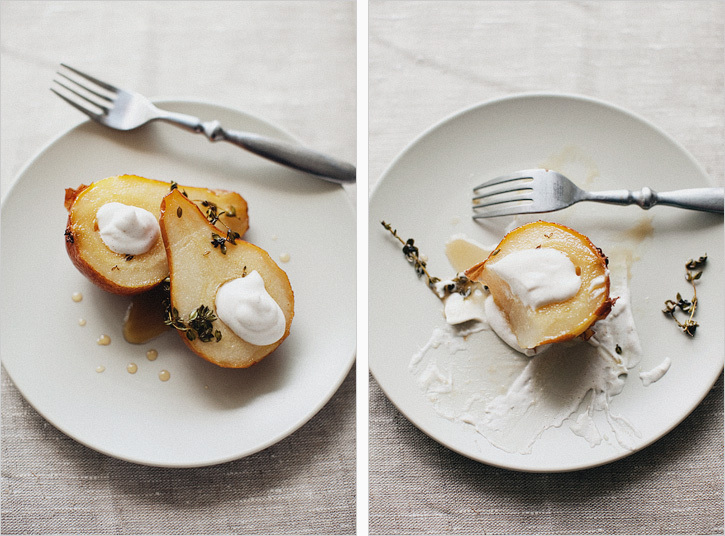 Put one or two pears on a plate, drizzle with a hefty spoonful of sauce with a sprig of thyme for garnish, and a generous dollop or yogurt cream. * If you were serving this to guests, you can do most in advance. I would pull the pears out of the oven just a few minutes early, let it cool and leave it covered at room temperature until you are ready to reheat them in the oven. They should probably warm back through in about 6 minutes. I don't suggest making the yogurt cream in advance, as the weight of the yogurt and honey will make the whipping cream fall completely. I'm a bit under the weather. While most people usually lose their appetite when they're sick, I can always seem to find mine. I fought through the desire for cookies alone, and decided something with a more impressive nutritional profile would make a better lunch for my wellness. I am also impressed that Hugh will eat tofu without hesitation. You can't say that about too many 6'5 men. Reason #987,543,222 why I adore him. Curdled beans. Coagulated soymilk. 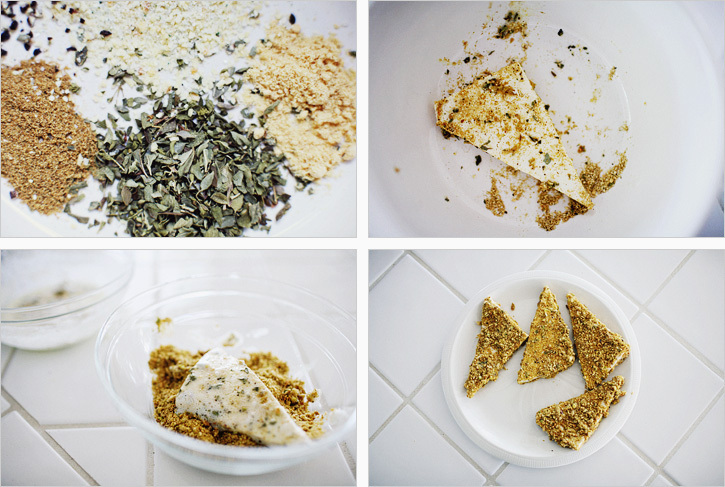 Tofu is not exactly the beauty queen of vegetarian protien sources, but her possibilities are endless. It's skin deep, my friends. I've eaten my fair share of tofu, but have never crusted it as follows, so this was a learning experience. If you cover a bland bean cake with all of these flavors and give it a crunchy crust, this fall-ish salad will suprise you. Farmers markets are brimming with greens, so shop well and even the lettuce will contribute to the flavor here. If you don't use bread crumbs often, you can toss a piece of toast in a blender and wa-la. Single serving of bread crumbs. *Press out as much water possible. Set it on a plate with a paper towel and under something heavy to press out remaining moisture. 1. For the dressing, add the first 5 ingredients in a blender and blend. Add the yogurt/sour cream and give it a pulse. While running, slowly stream in the olive oil. Add salt and pepper to taste. 2. In a medium bowl, whisk up the egg whites until they are lightly frothy. Add the cornstarch and continue to whisk another minute to combine. 3. Grind the pistachios and bread crumbs and put that mixture in a medium bowl. Add the salt, cumin, pepper, garlic powder, oregano and mustard powder to the nut mixture. 4. 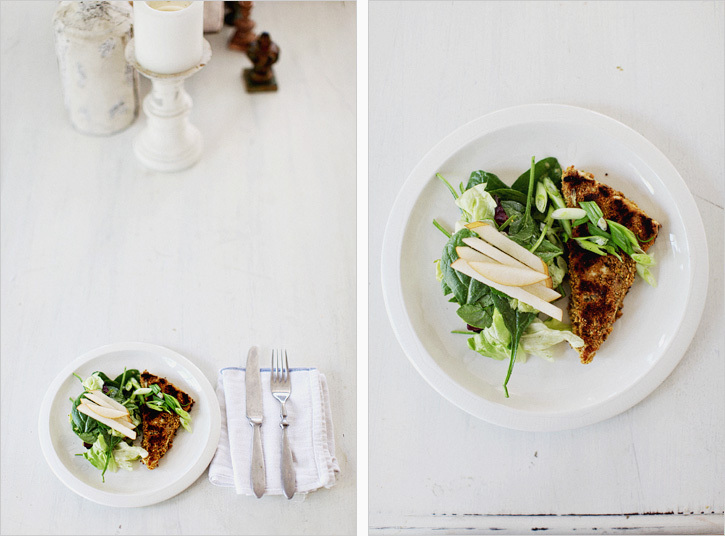 Slice the tofu in half width wise, and then diagonally to form triangles. Working with one piece at a time: Pat the tofu dry, dip in the egg mixture, then the nut mixture, and place on a baking tray. Repeat with each slice of tofu. 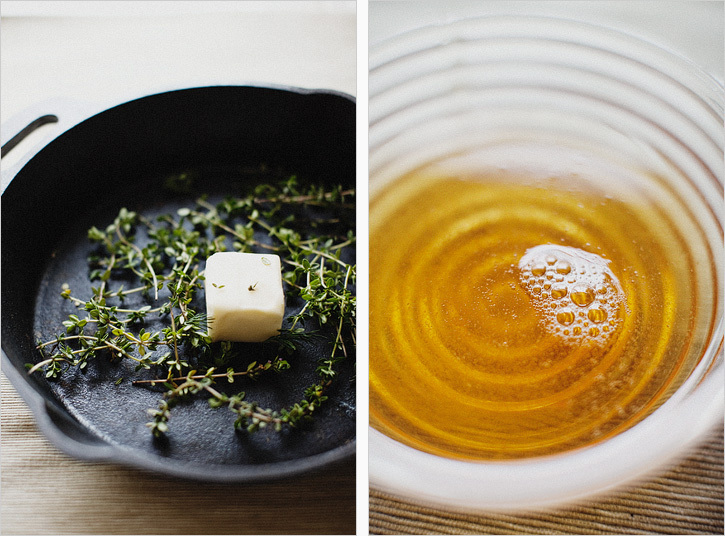 * At this point, if you prefer the tofu cold, you can chill them in the fridge. Or, continue with directions for warm tofu. 5. Set oven to 350’. Coat the bottom of a saucepan with oil and warm over medium heat. Fit in tofu pieces without touching, you will probably need to do two sets. Sear for about 2 minutes on each side until golden and crispy, return to baking tray. Repeat with all tofu chunks and pop the tray in the oven to warm through. 6. 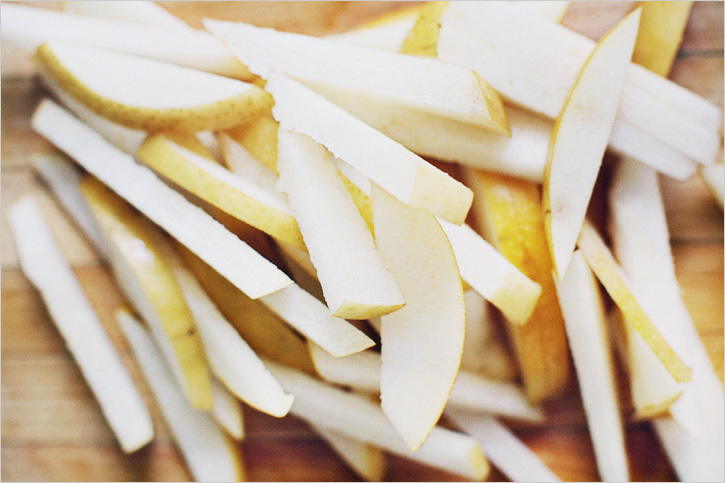 In the meantime, Slice the asian pear into matchsticks. Toss the greens, green onion with desired amount of dressing. Plate with asian pear slices and tofu chunk on top.